The invitation came nearly a year ago. 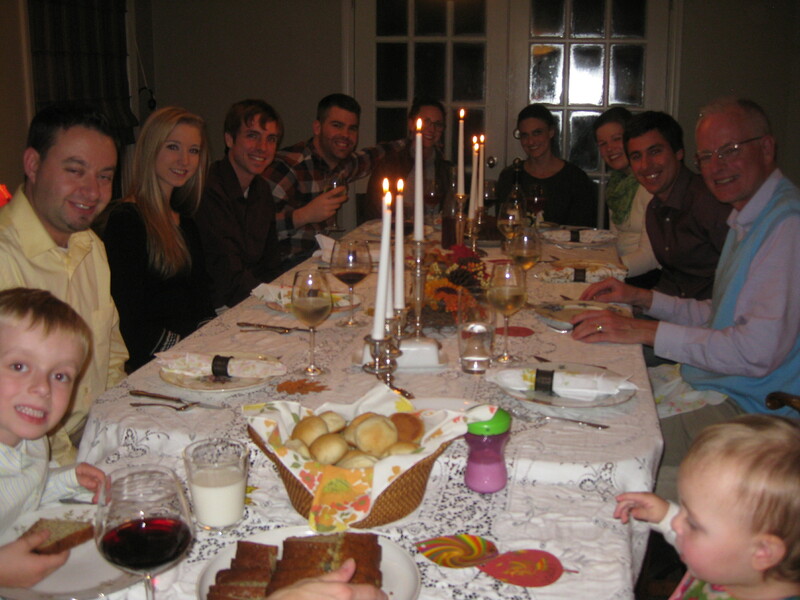 It was our turn to have the kids for Thanksgiving and our son, Carl, invited us all to Milwaukee for the holiday. We were quick to accept. It’s a tricky game. Marrying off the kids and sharing them with the in-laws can be complicated. We should know, we went through it ourselves as young newlyweds. I remember well that first Christmas, traveling home to be with family. The good news was that both sets of parents lived in Duluth. The bad part was we spent Christmas Day ping ponging back and forth between houses trying to be everywhere at once. Not a wise idea. The year we stuffed the car full of gifts for the trip home with the tricycle wheel spinning over one of the carseats, we reached our limit. Christmas would be at our house in the future. Those memories compel us to try and make it easy on our kids, allowing them take the lead and let us know what works for them. Fortunately, for starters at least, they have all managed to land on a common schedule. Thanksgiving with us one year, Christmas the next. By now we’ve experienced both holidays “kidless.” It’s not so bad, really. The key is not to dwell on their absence, but to strike out and do something new. Viewed as an opportunity as opposed to a loss. Good friends become family for a day. Or we take ourselves somewhere new for a treat. Different yes, bad no. This Thanksgiving marks the first time we have been guests, not the hosts for a family holiday. It was a change, but adapting was oh so easy. 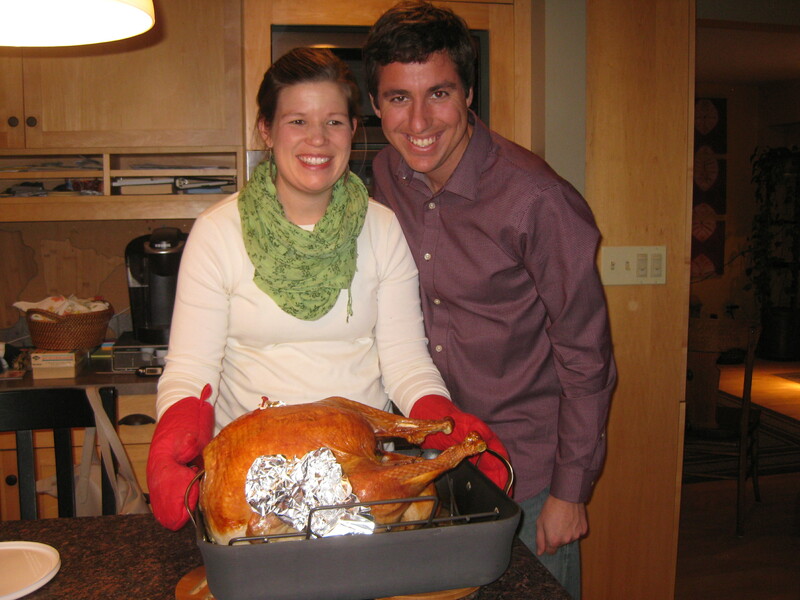 Carl and Chelsea set a beautiful table and produced a bountiful turkey. The rest of us brought our favorite side dishes and desserts, all prepared ahead of time. I have to admit I watched in admiration as Chelsea calmly puttered over those labor intensive last minute sides of potatoes, gravy and vegetables. It brought back memories of my anxieties over gravy that would not thicken. Potatoes that took longer than expected. And getting greatly flustered over the whole bit required to bring it all together at once. I was happy to turn it all over to younger, very competent family members. Sure, we all pitched in. But someone was in charge and holding the reins. And that someone wasn’t me. What a pleasure to sit at Great-Grandpa Hoeg’s long dining room table lit by his candelabra, surrounded by our family now numbering 11 and friends. We are now the top of this family line, and it is humbling to think that this fine array of individuals are the product of our own marriage 33 years ago. We are truly blessed. I’m not entirely ready to give up hosting for good. I still crave gathering my family at Grammy and Grandpa’s house. I still love anticipating their arrival and hugging each as they arrive and fill up all our available space. It still feels right to have them all come home. We have another invitation for Christmas, even though its technically not “our” turn. But who can resist waking up Christmas morning in a house filled with our grandchildren? I’ll readily pass the torch for this one too. I just may ask for it back now and then. We knew this day was coming. It just caught us off guard when this turned out to be the year. All of our children were spending Christmas with their “other” families – in-laws or almost-in-laws. Ours was to be an empty nest Christmas. 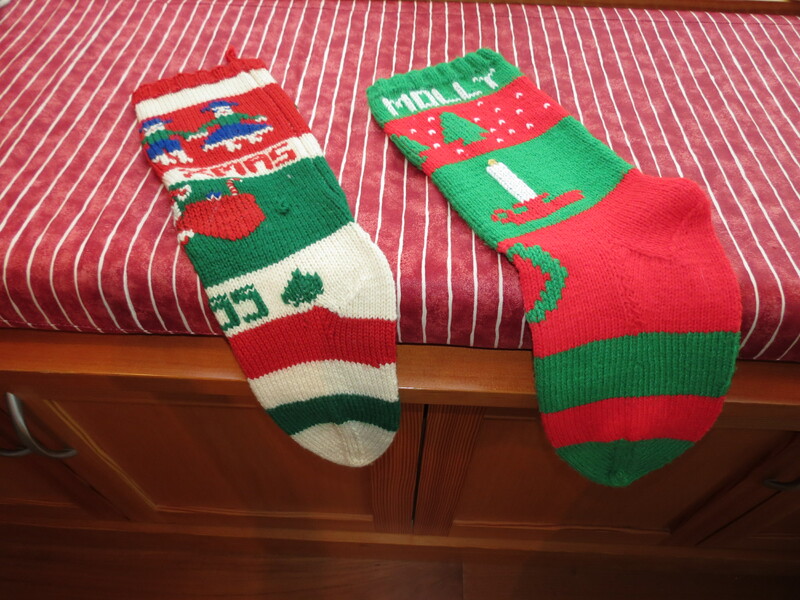 Only two stockings to hang for Santa this year. It’s all part of the natural progression. Kids grow up. They get married. They live their own lives. 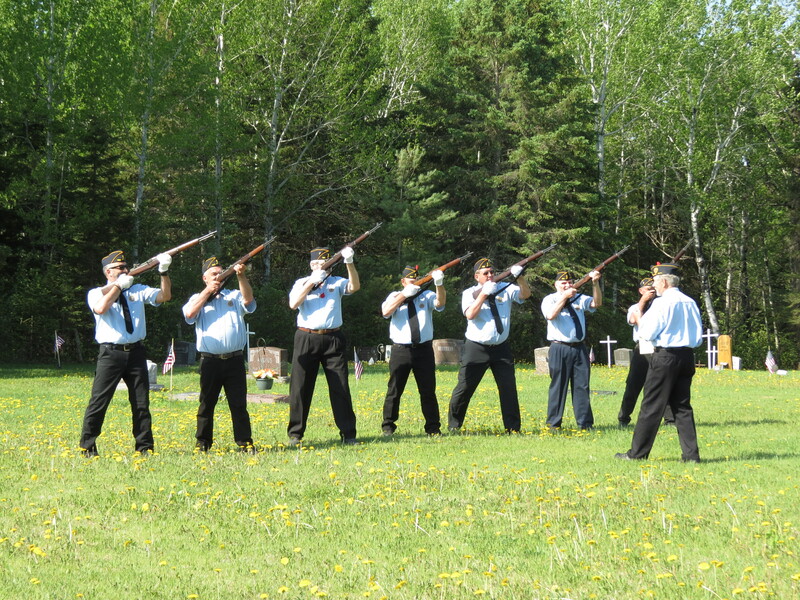 We are a close family, but we also know they need to spread their wings and make new traditions. So we set about doing the same. We realized that adhering to the usual routine would be a guaranteed path to feeling lonely. So we decided to take ourselves away for Christmas. A destination Christmas, if you will. 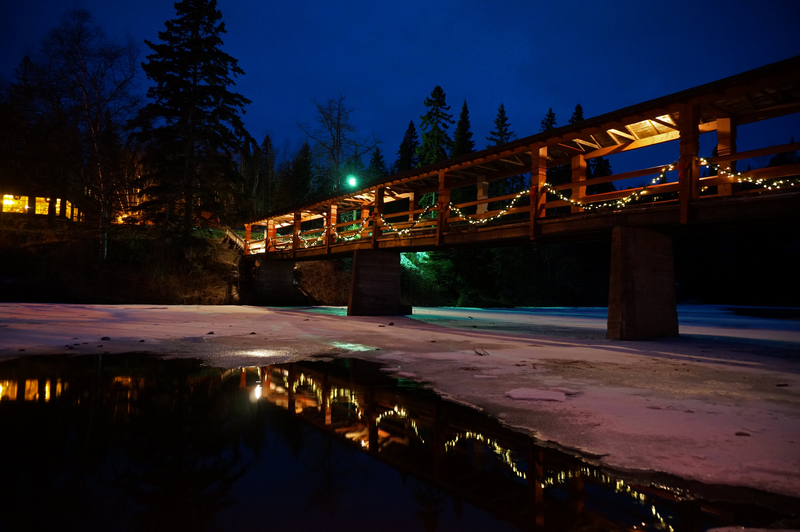 Making reservations at Lutsen Resort on the North Shore felt right, and we looked forward to spending the night in the old style lodge. 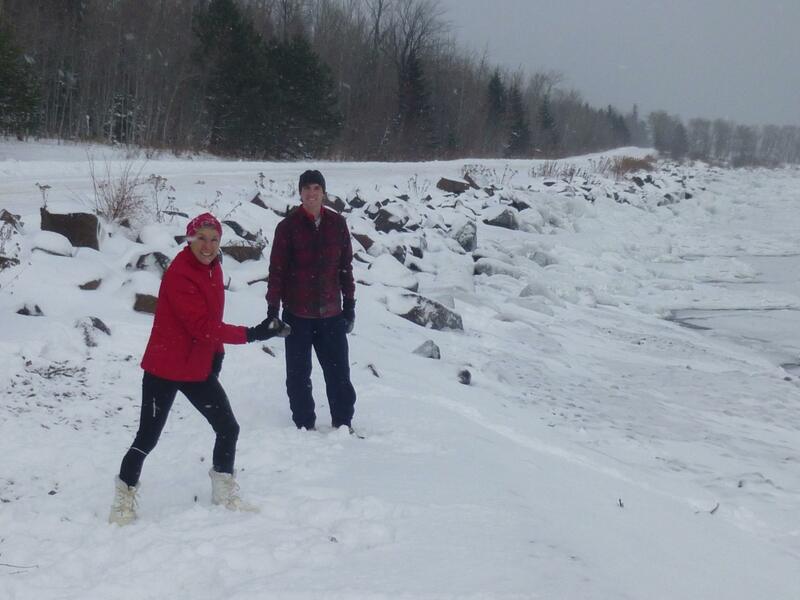 The original plan was to spend Christmas afternoon cross-country skiing. When the snow failed us, we changed it to hiking. 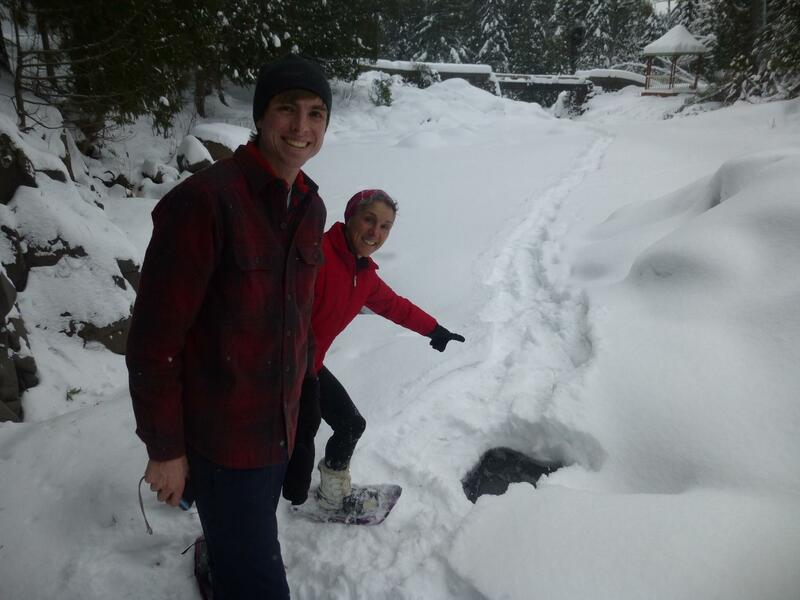 But Mother Nature nixed that idea as well, when we found the trails too icy to navigate safely. It wasn’t too hard to accept extra time in front of the big fireplace in the lodge, and I soon found myself nodding off over my book then chatting with other guests by the Christmas tree. 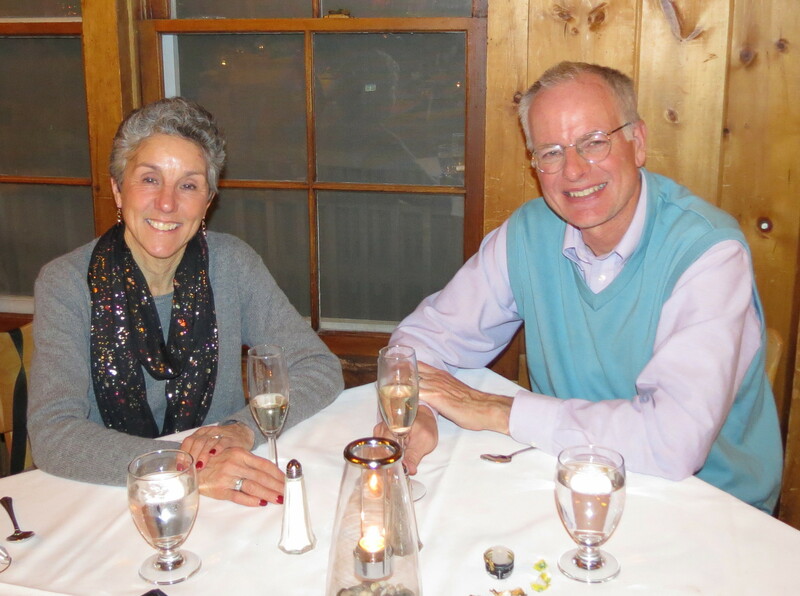 The only reservation left for the Christmas buffet dinner was at 8:00pm – an outrageously late time to eat for this couple, but this adventure was all about change, so we accepted it graciously. With plenty of time to linger, we each drifted outside. Rich was eager to try out his new camera, and got some great night-time shots. I had a bonfire to myself on the beach with its mesmerizing flames and the sound of the Lake Superior waves lapping on the shore. 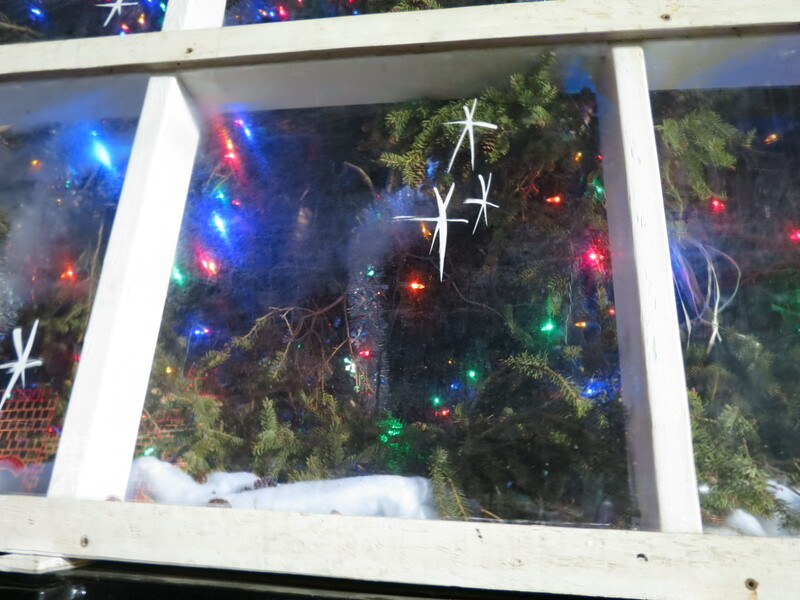 It was easy to feel all the holiday tension slip away in the beauty of that scene. 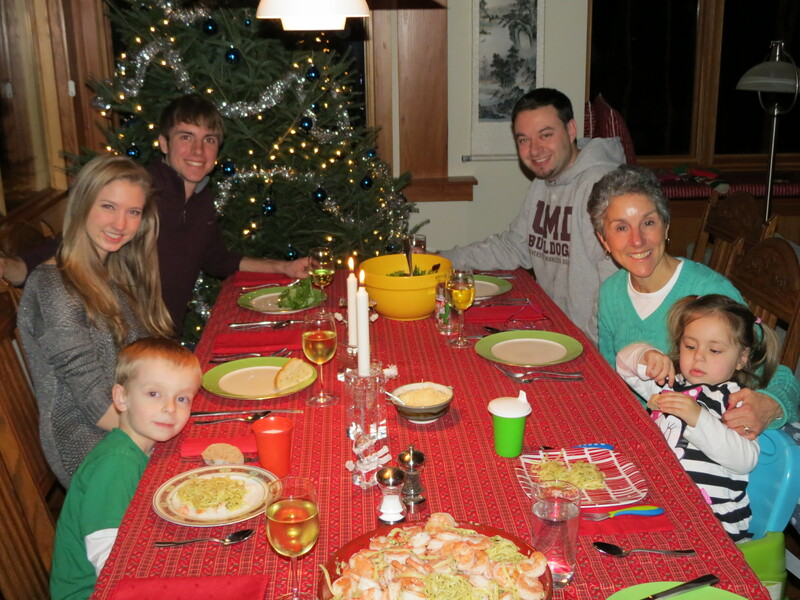 Topping off our evening with a festive Christmas dinner was a fitting finale. Morning found me running along the lake shore and Rich birding. What else is new? 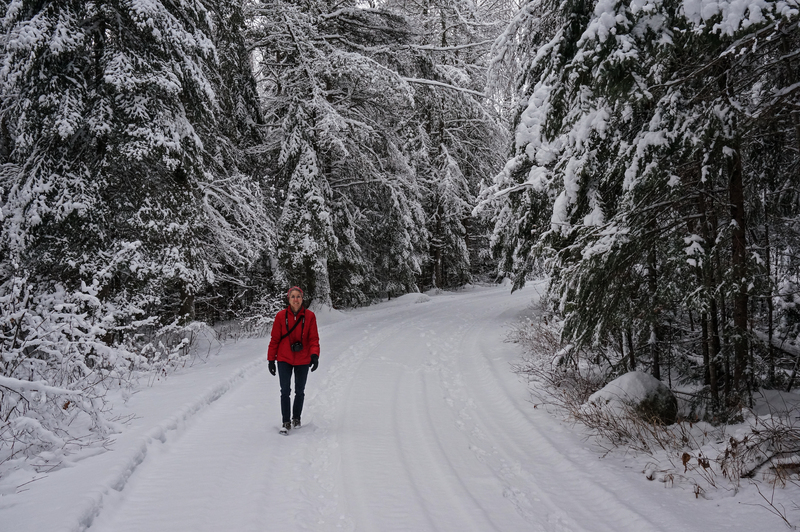 But Rich came back all excited and soon dragged me up the Caribou Trail to find… SNOW! The farther inland we drove, the deeper the layers on the trees. Finding a road designated for foot travel only, we took a hike through the winter wonderland. It was silent and beautiful, yet another opportunity to drink in the peace and shed life’s cares. Another magical moment of our unconventional Christmas. Within 15 minutes of reaching home, our children and grandchildren began to arrive. The house soon filled with the bustle, noise and activity of three generations. Our family Christmas celebration began. And our nest was no longer empty. It was worth the wait. There’s a pine tree standing in our entryway. Boy, it smells good. Once the branches drop and stop dripping from the ice and snow, it will move into the great room. Who ever thought of bringing the outside in for Christmas sure had a good idea. I’m not sure I could handle Christmas in a warm climate. The cold and snow are an integral part of what signals the season for me. 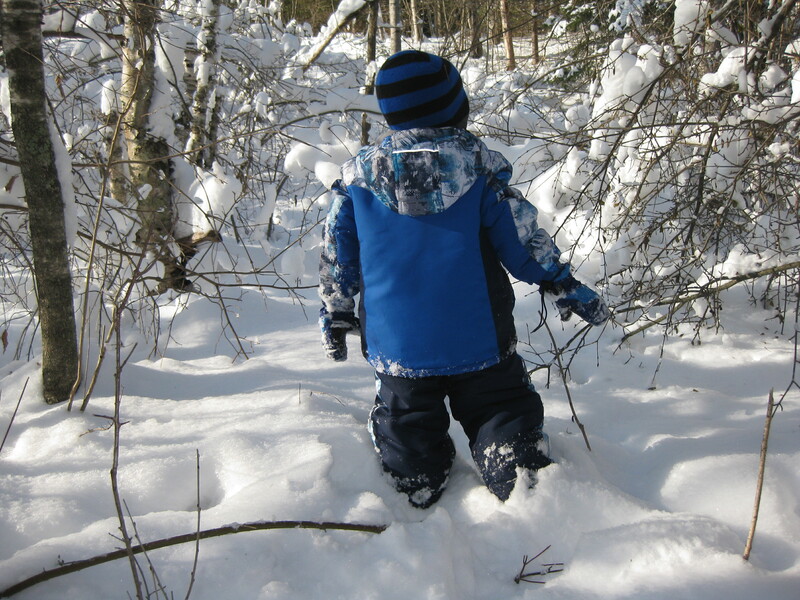 Even if it means cold toes, bundling up and heading outdoors for the season’s festivities are part of the package. 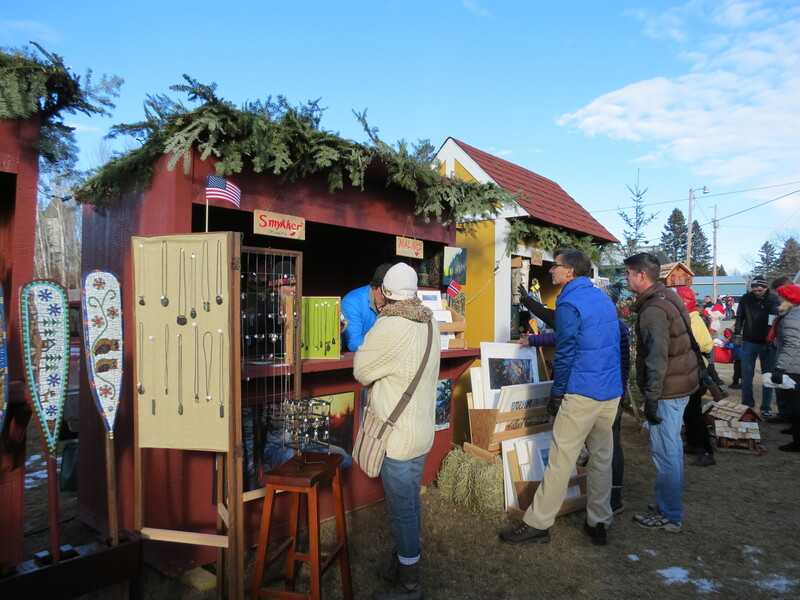 The typical Christmas craft fair took on a new look recently when Knife River started up Julebyen. 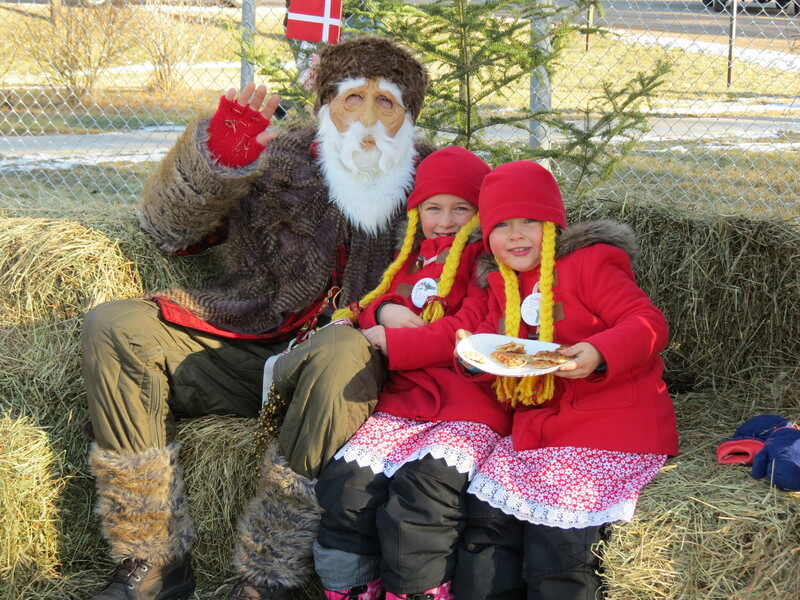 That is the Norwegian word for Christmas Village, and it combines a place for celebration and gathering with music, crafts and food. And it’s all outdoors. 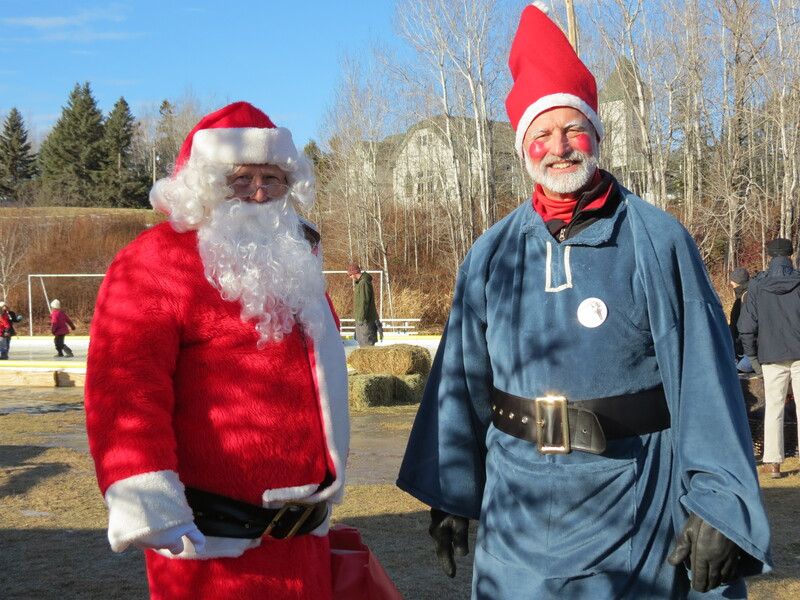 In this its second year, the weather was far more seasonable than last year’s frigid temperatures, making it pleasant to wander down the short “street” of village shops and peruse the fine wares made by local craftsmen. 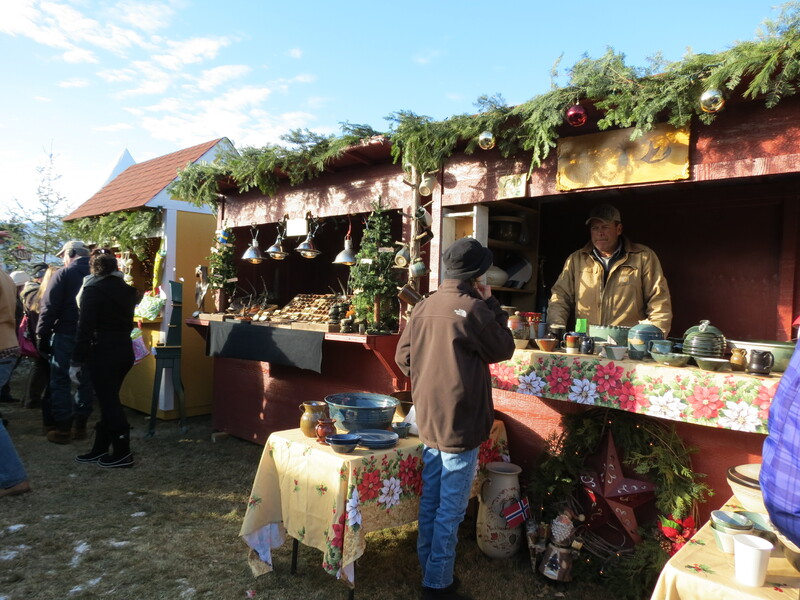 The tent at the end of the row offered Norwegian delicacies, and a musician playing the dulcimer provided entertainment. In the background the skating rink hosted an active group of children enjoying the winter ice. Combined with colorful Norwegian characters, it was a delight to the eye. 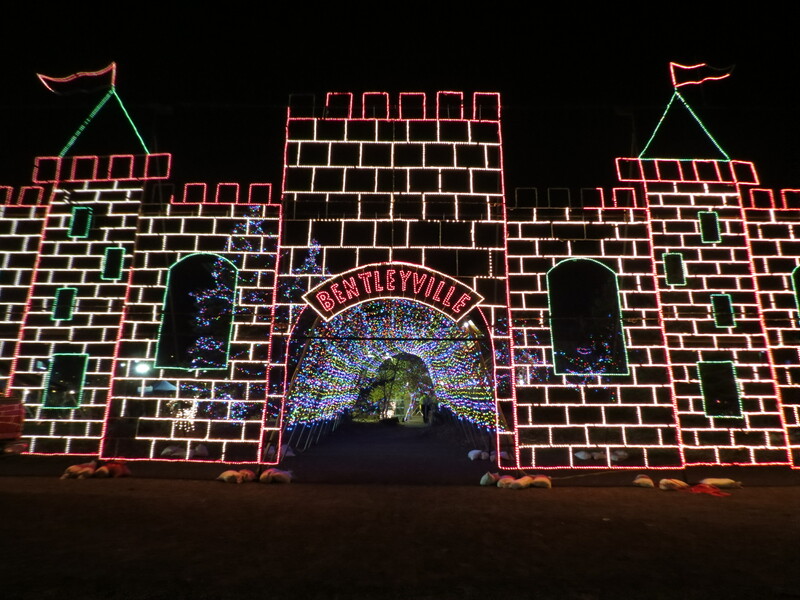 For nocturnal outdoor fun, nothing beats a trip to Bentleyville. 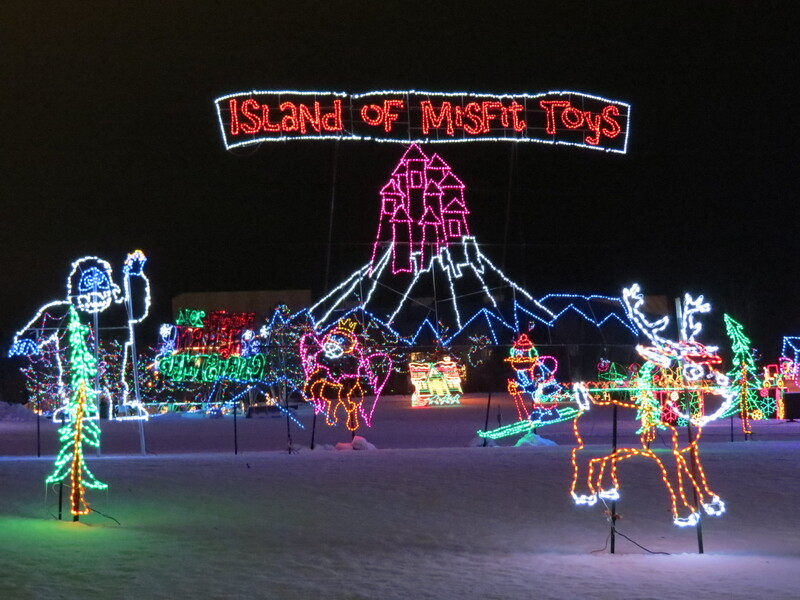 The collection of Christmas lights and surround-sound seasonal music is irresistible even to adults. 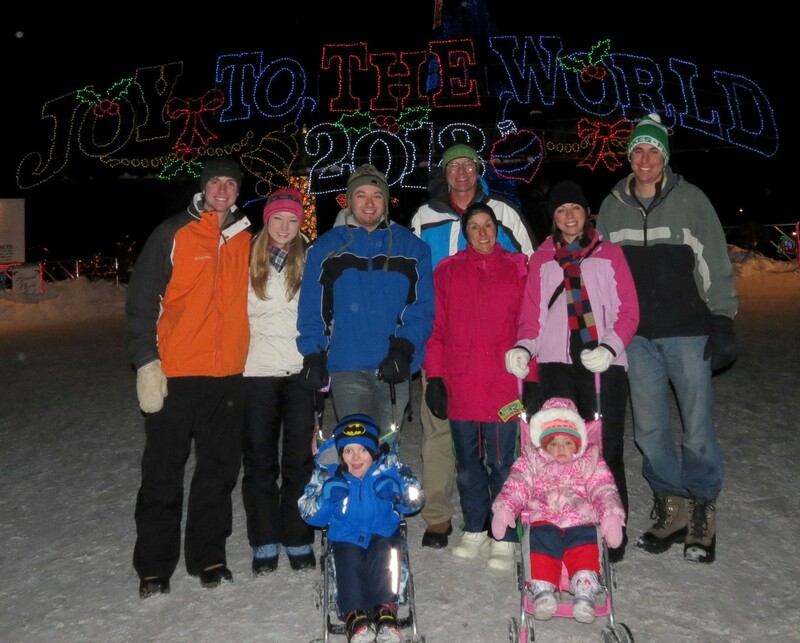 This year we went without the benefit of children and grandchildren, and enjoyed the light show as much as ever. 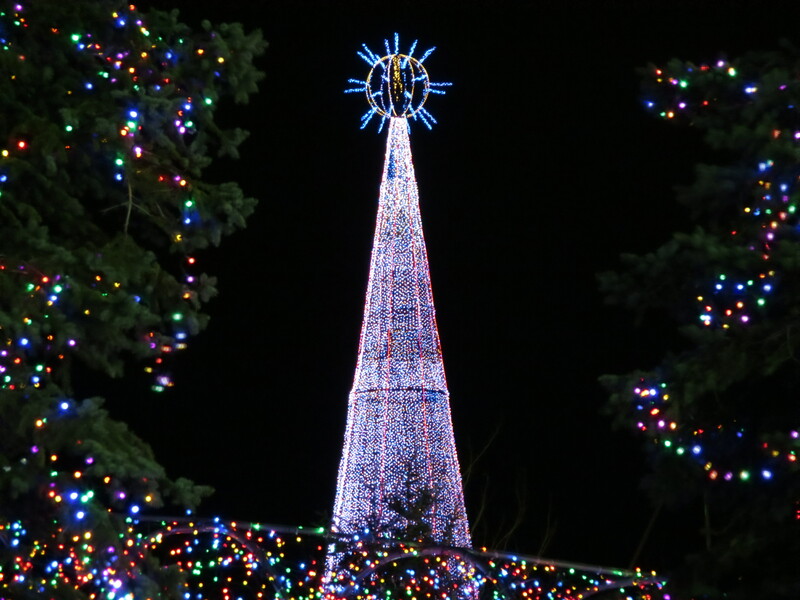 The “dancing tree” was my favorite – watching the 130-foot tall conical Christmas tree’s lights pulsate in patterns in time to the upbeat music was great entertainment. We commended ourselves for spotting a few new additions, including Split Rock Lighthouse and some Tall Ships sailing near the illuminated Aerial Bridge. 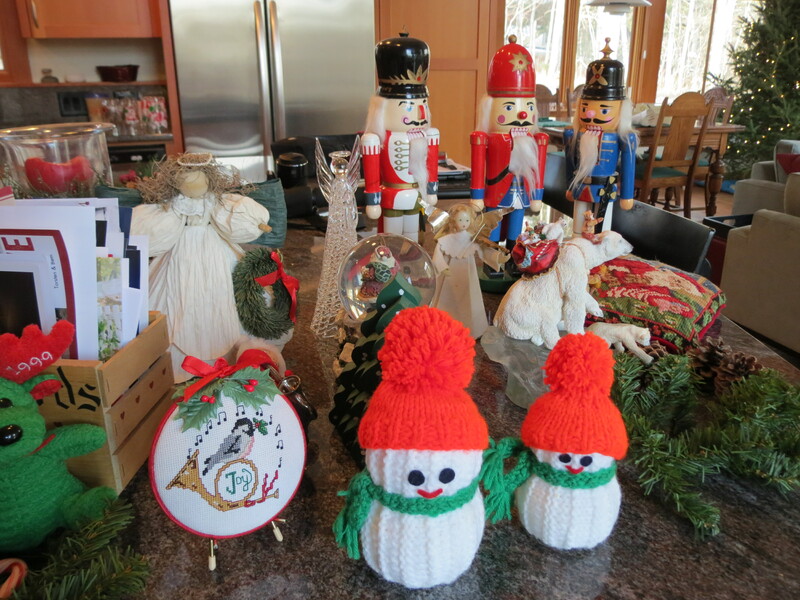 It’s hard not to feel the magic of Christmas, surrounded by so much fanciful brilliance. Yes, it’s good to have the smell of pine permeating the house, and a real tree temporarily rooted to the floor. It will tide us over until our next Christmas al fresco activity. Hmm, Christmas caroling anyone? For 45 years, the National Forest Service has provided the nation’s capitol with it’s Christmas tree. And this year it came from “our forest.” Not only is our cabin in the Chippewa National Forest, we actually lease the land it sits on from the Forest Service. So I feel justified in identifying with this tree. 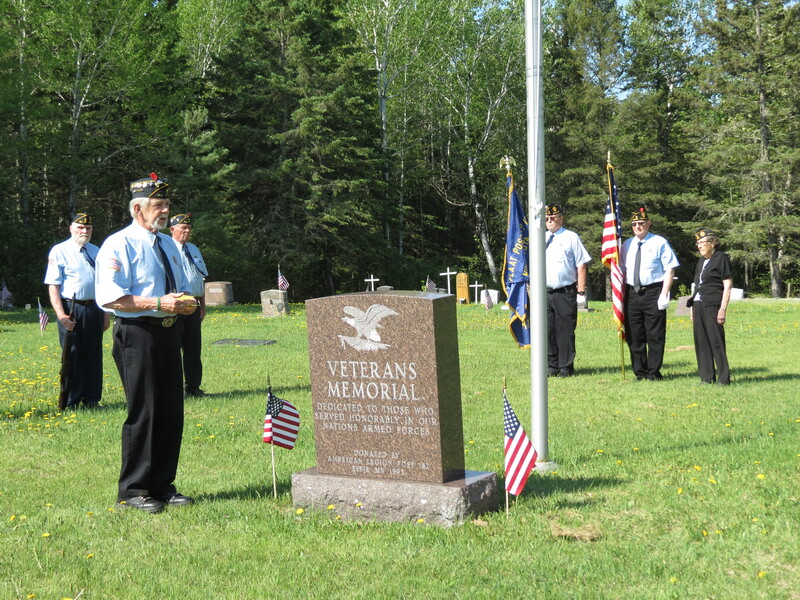 Not only that, but the man who cut it down – Minnesota’s logger of the year – was from Marcell. Home to the bait shop, just down the road from the cabin. It doesn’t get much more personal than that. I honestly knew very little about this Christmas tree program before now. 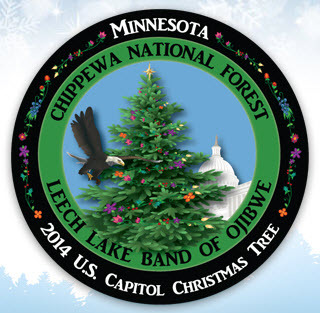 I missed it entirely in 1992, the last time the Chippewa National Forest provided the tree. But something about this year’s tree peaked my interest. I was fascinated when reading about how it was cut down. One doesn’t just fell a Christmas tree. No “timmmmber” for this tree. It was painstakingly secured and carefully lowered by two gigantic cranes onto a specially built wooden crib on a flatbed truck. There it was wrapped and cradled for its 2,000 mile journey to Washington DC. At 88 feet tall, this white spruce required a 100-foot long truck and trailer for its transportation. Out of the 30 stops the tree will make along the way, one of them was in Duluth. It was scheduled for this evening, and I decided I had to be there. So camera in hand, bundled in winter jacket, hat and gloves, I headed down to Bayfront Park. I’m not sure what I expected to see. Surely, I should have realized it would be housed in its truck. But still I felt rather underwhelmed to only be able to see a few branches of the tree through the windows at the back of its special truck. Like everyone else around me, however, I took my requisite pictures of the truck. Having anted up my $5 for parking, I wasn’t willing to leave it at that. The park was brimming with families, enjoying the bonfires, s’mores, hot chocolate and cookies on offer. 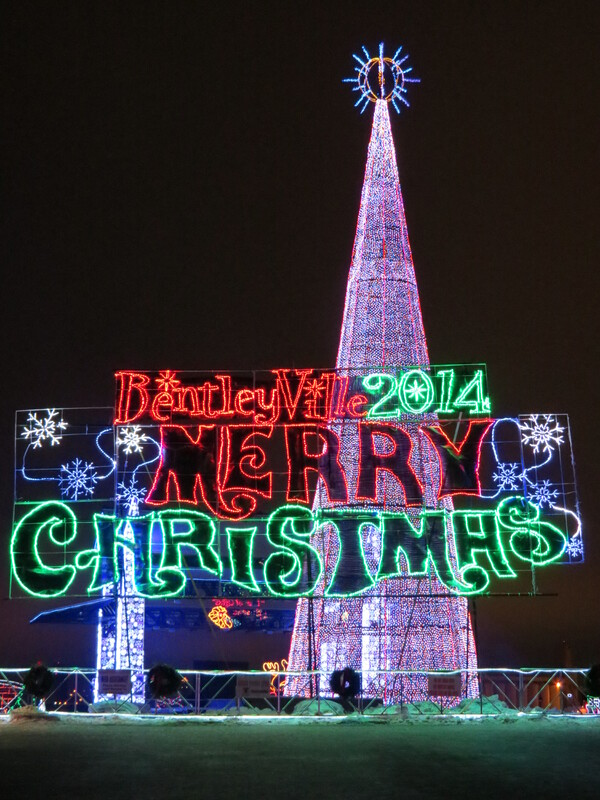 With a good share of Bentleyville lights already glowing, it had an eerie feeling of early Christmas without the snow or deep chill. I’m not a fan of pushing the Christmas season so far in advance, but this particular celebration seemed justified by the presence of The Tree. 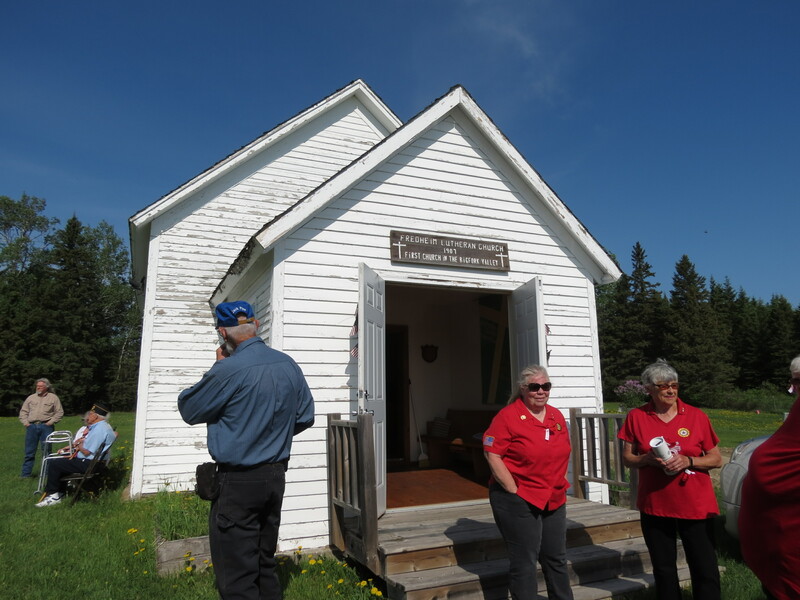 Wandering over to the booths, I was soon engaged in conversation with the folks from the Chippewa National Forest. There we traded Marcell stories and expressed mutual love for North Star Lake. 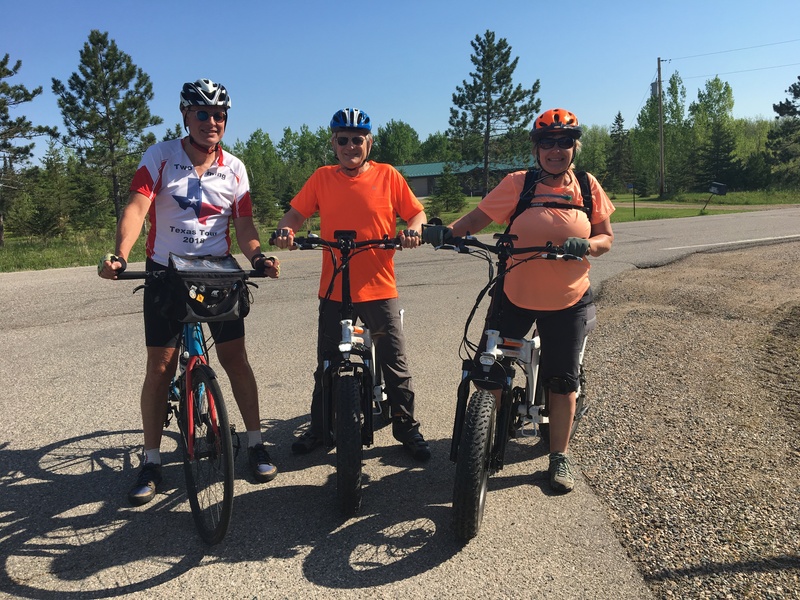 I met a man from Choose Outdoors, a non-profit organization that supports public lands by promoting outdoor recreation and an active lifestyle. Now that was right up my alley. He was part of the support crew for the tree’s journey, and in fact had accompanied several Christmas trees from their source all the way to Washington DC. My conversations transformed the evening. Suddenly it felt quite enchanted. The joyful spirit of the families surrounding me was infectious. And returning to the tree’s truck, I realized just how long it really was. Not your ordinary semi. Quite impressive, really. I took a few more glaces around to admire Bentleyville’s own unique Christmas tree. It danced and spun through the magic of modern technology and its light show. May the nation enjoy Minnesota’s tree when it first lights up on December 2. O Christmas Tree indeed.